Researchers speculate that variations in preschool physical activity may be attributed to variations in preschool policies and practices, including the form and content of outdoor physical environments. However, assessment methods linking them to physical activity are limited. 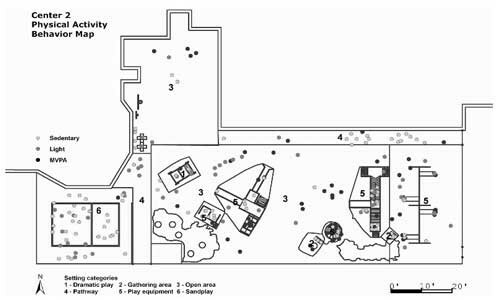 Improved understanding of links between environment and activity could be used to influence childcare policy, which is highly regulated, usually at state level, to create outdoor environments more conducive to children’s informal play and physical activity. The purpose of this article was to introduce behavior mapping as a direct observation method on the basis of the theories of behavior setting and affordance and to demonstrate its sensitivity to gathering physical activity and associated environmental data at a sufficiently detailed level to affect built environment design policy.